If it were up to me I'd sift through my 200-and something photos from Helsinki and blog them all right now, but alas, the call of baking moussaka and the familiarity of my bed are sirens I can't ignore (this is coming from a Londoner who can sleep through a fire alarm, ambulance and police sirens...all at the same time. True story). 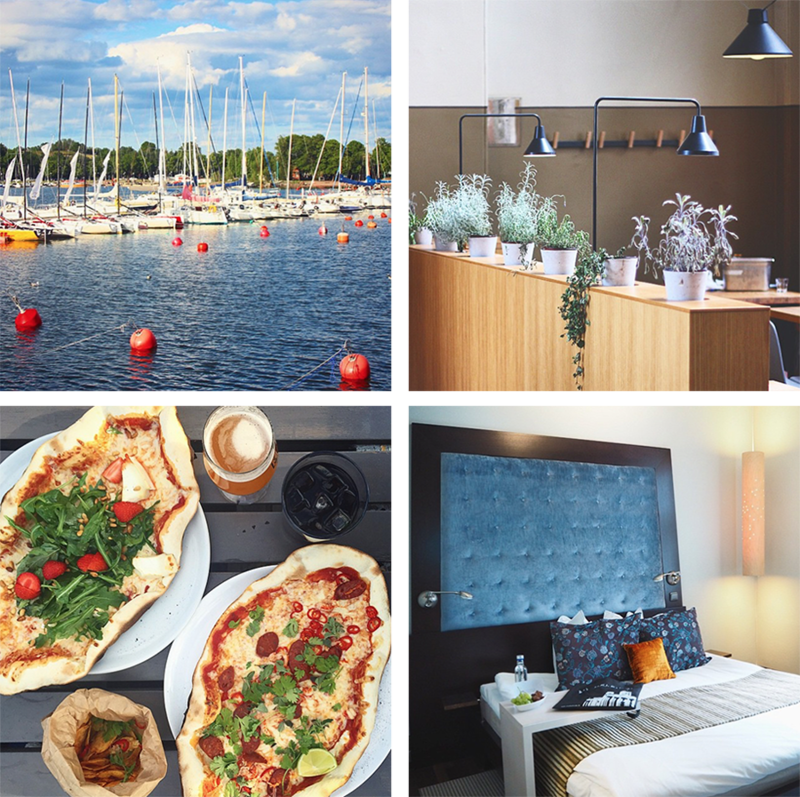 There will be Helsinki posts on the blog, all of next week, but for now, just a quick look at some of my pictures and my first impression(s) of this Scandinavian hipster capital. Helsinki in bloom. These dandelion-esque flowers were everywhere, turning green to lilac. I haven't a clue what they're called - will any botanists reading this come to my rescue? 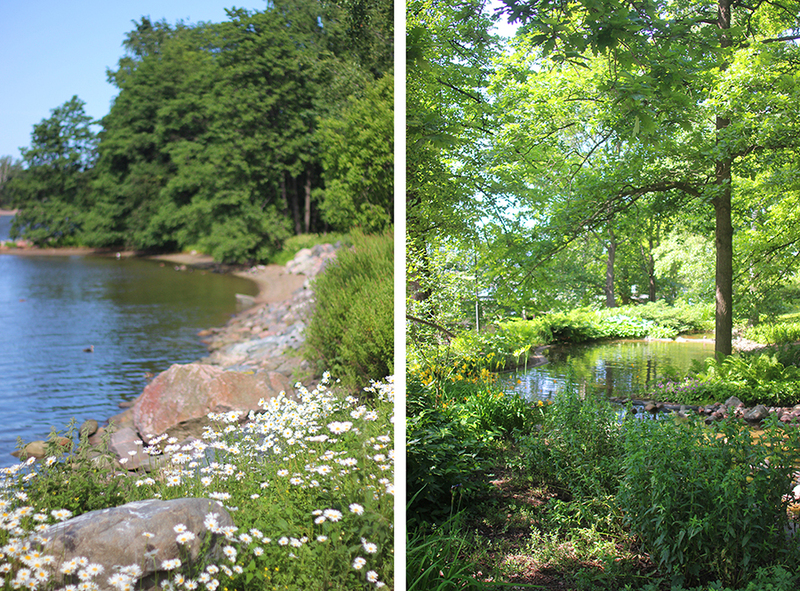 The verdant, untamed landscape of Korkeasaari island, site of Helsinki Zoo. Think London is green? This city is wild. //a// Hello buoys! Bobbing about at Skiffer island. //b// Warm, Scandinavian minimalism (the sort Pinterest, Instagram, Tumblr etc. go gaga for) in the flesh at Story cafe. //c// Strawberries on pizzas at Skiffer Restaurant - that is all. //d// Our 'Desire' room at Klaus K, a design hotel in the middle of Helsinki's Design District. 1. There are a lot of dogs in Helsinki. I mean, a LOT. Poodles, Labradors, schnauzers, dachshunds, spaniels...all of man's best friends, big and small. From the moment I arrived at Helsinki airport it was clear that this was very much a dog's city. True to the spirit of Scandinavian inventiveness, there's 'dog parking' outside supermarkets. 2. The unofficial Helsinki livery is Marimekko print. Helsinkians, heck, the Finns LOVE Marimekko on hats, tees, tote bags...I even saw a Finnair plane decked out in the iconic red flowers! You know I'm quite impressionable, so it was a given that my only souvenir from Helsinki was a Marimekko cushion cover (red poppies, obviously). Apart from the red flowers, many of the locals sport stripes - which I'm fairly certain are also Marimekko. 3. They eat Rudolph! Reindeer hotdogs, meatballs, burgers anyone? I tried reindeer meat for the first time (knowingly, anyway) and it's very lean yet hearty, with quite a fragrant earthiness about it. The rest of the animal isn't wasted - reindeer pelts are made into hats, throws, capes etc. For €150 a pop you can buy soft reindeer rugs from the market square, souvenir shops, the airport...you name it. 4. The cashless revolution! Cards are accepted everywhere in Helsinki - from the numerous Ingman ice cream kiosks dotted about the city to the many boats and ferries we had to take to hop around Helsinki's nearby islands. I had to withdraw cash from the ATM only once during my entire trip - on our last day, to shop at the flea market. Can I also say it's impossible to find a cash machine in the city! 5. Helsinki is very compact, just like Riga, and although the population is not as sparse there is a pleasant ratio of people to space. Sure, there were many tourists (most of which were Japanese) and effortlessly chic locals about, but not once did the city feel crowded - even on the sunniest of days when families pushing strollers lounged by the ports and the entire city seemingly descended upon the parks. 6. Bicycles are very much a part of Helsinki's culture. Thankfully, for such a trendy city there was nary a unicycle or penny farthing in sight (I wish I could say the same about East London...). I did however see several gorgeous mint green bikes with brown leather saddles that made me wish I could ride a bicycle (there, now you know my secret). 7. The seagulls are VICIOUS. Every market square, food stall, or ice-cream kiosk had signs warning "Watch out for the gulls!" or "Do not encourage the feathery hell-raisers" with a crude drawing of birds pecking people. I had a pack of 20 seagulls hover menacingly behind me while I was eating an ice cream. Henry told me to not to look because he knew I would've screamed and throw my arms in the air, sparking a blood (and feathers) bath. It sounds amusing, but I can assure you that even from a distance, the sight of Helsinki's seagulls closing in on anyone who dares eat outdoors by the port would make even Hitchcock's chins tremble. 8. A lot of the Finns I met in Helsinki are blonde, rosy cheeked and speak perfect English with a lovely accent. I don't know if it's the norm, but they say 'nothing' when they mean 'sorry' and 'ok' is 'sure'. Oh, and a 'hoy!' (hello) goes a long way! 9. From what I saw at Helsinki Zoo, the Finns respect animals. There was, hilariously, a fluffy rabbit sunbathing ever so smugly in an outdoor enclosure that was basically a huge island full of wild plants. I admire how the rabbit wasn't 'patronised' into living in a twee, gingerbread house, and treated like a doll, but rather recognised, rightly so, as a wild animal. Children are taught from a young age to not harass animals - I saw a toddler approach a gosling and her mother repeatedly admonished her, then again another toddler wander towards some stray goslings only for his older sister to swoop in and carry him off. 10. The city is as well designed as I'd imagine - compact, efficient, trend-setting; but nobody told me how fresh the salty air was and how energised I'd feel after a mere four days in Helsinki. Can't wait to read your posts - I've always wanted to visit Helsinki, it looks like such a beautiful place! It all sounds a bit too perfect...(apart from the seagulls) I would have felt slight suspicious of this blonde haired, blue eyed world where everyone love animals and rides bicycles ;) Can't wait to read your posts! I was looking forward to this post! It's somewhere I'd like to go too. Jealous! Also, I believe the flowers you're after are Big Ball Alliums. My Baltic blood tells me so! Dogs!! I would LOVE it there! Also, reindeer fur is SO soft - my favourite pub, The Smokehouse, has them strewn around the dining room for comfort and warmth, and they're so pretty and sooo soft! Looks like a lovely place to visit, I can't wait to see your upcoming posts on it!